In Ohio State coach Thad Matta’s head coaching career, he has stood on the sideline for 531 games. He has won 403 of those, while dropping 128. But in none of those 531 contests has his team had more losses than wins in the record column. That will change on Tuesday, as the Buckeyes (2-3) are set to welcome No. 10 Virginia (5-1) to the Schottenstein Center for a 7:30 p.m. matchup as part of the Big Ten/ACC Challenge. OSU’s season started off without any noteworthy results, grabbing 20-plus-point victories over a pair of unspectacular opponents. The wheels came off from there, however, as consecutive home losses to Texas-Arlington and Louisiana Tech dropped OSU to .500, before an overtime loss to Memphis in Miami gave Matta a losing record for the first time in his career. Sophomore forward Jae’Sean Tate said having a losing record comes as a shock when a player comes to a school like OSU, but the team has to keep its composure and keep getting back on track. Tate and fellow sophomore forward Keita Bates-Diop each offered the same two culprits for the Buckeyes’ struggles: turnovers and poor free-throw shooting. The Buckeyes are turning the ball over 16.2 times per game, ranking 323rd in the nation out of 346 qualifying Division I schools. Virginia, on the other hand, ranks second with just 7.5 turnovers per game. Matta said the praise for the Cavaliers’ efficiency lies with coach Tony Bennett, who is now in his seventh season in Charlottesville, Virginia. “I think Tony Bennett has done a tremendous job in terms of coming in and establishing that program … I don’t think Virginia gets the respect of other schools, but they’re as good as any of them, that’s for sure,” Matta said. For the Buckeyes, Tate said it is never easy to snap a losing streak, and the team is unlikely to get any help against a team like the Cavaliers. Still, he said the team is trying its hardest to keep its focus one game at a time. Virginia comes into Tuesday night’s matchup 5-1, with the lone loss coming in a second-game hiccup at George Washington. While the quality of its other five opponents hasn’t been the strongest, Matta said he has been more than impressed with what he’s watched. Virginia — which earned a No. 2 seed in the NCAA tournament a season ago but was ultimately upset by Michigan State in the Round of 32 — uses a balanced offensive attack rather than relying on a go-to scorer. Redshirt senior guard Malcolm Brogdon leads the team with 16.7 points per game. The 2014-15 AP All-American Second-Team recipient has also chipped in 4.5 rebounds and 3.2 assists per game. The Cavaliers have shot exceptionally well this season, shooting the ball at a 51.7 percent clip from the field while holding opponents to 39.1 percent. Those marks rank 13th and 74th in the nation, respectively. After the Cavaliers, the Buckeyes are set to resume action on Saturday against another school from the 10th state — Virginia Military Institute. 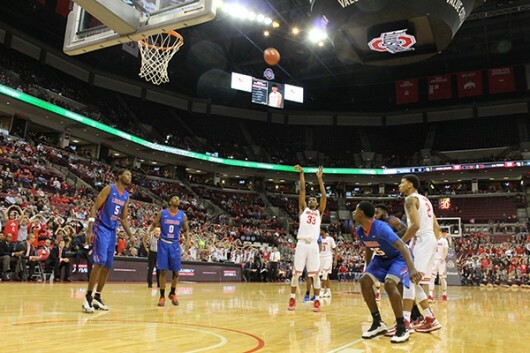 Tip is scheduled for 4:30 p.m. at the Schottenstein Center.